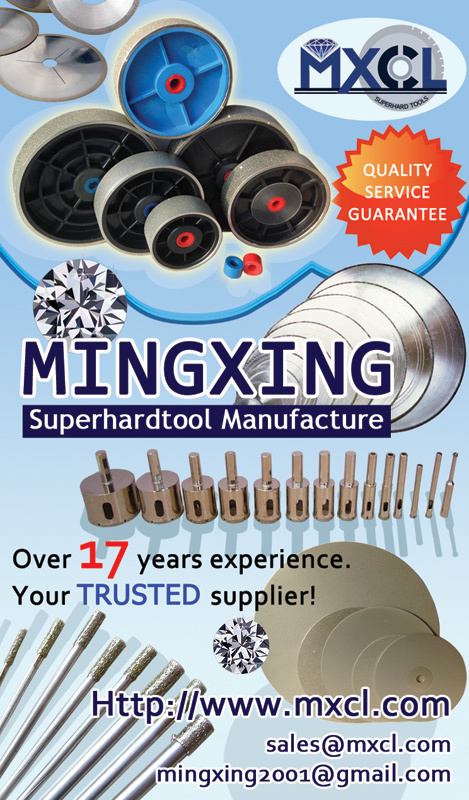 Located in Shanghai, Mingxing Superhard Tools a leading manufacture and supplier of quality superhard tools and equipment. Since 1995, we’ve dedicated to providing a big variety of super abrasive products such as diamond saw blade, diamond drill, grinding wheel, diamond burr, flat lap, PCBN, CBN, PCD, diamond file set for the wide use in lapidary, jewelry, glass, ceramic, construction, optical, wood, semiconductor, automotive industries. Meanwhile, we’ve been striving to create lasting relationships with customers all over the world in the past 17 years. With advanced technique and strict quality control system, our products have gained good reputation in both domestic and international market. Let us know what you are looking for your business. We’ll be very happy to advise you on what will best suit your needs and requirements. We hold ourselves to the highest quality standards in the industry and ensure our products pass strict regulations. We guarantee that our customers can always count on us for premium quality and excellent service. We care about you and want you to be happy with your purchases. We value long term cooperation much more than profit. By choosing to work with us you cut out the middle man and get what you need at an amazing price. Meanwhile, we are always working hard to reduce the cost while keeping and improving the quality. Let us know what you are looking for, and we’ll be very happy to advise you on what will best suit your needs and requirements.